On July 31, 2006, California Governor Arnold Schwarzenegger and First Lady Maria Shriver announced the creation of the California Hall of Fame, a groundbreaking institution extolling the inspirational contributions of extraordinary Californians who have made their mark on the state, the nation and the world. John Muir is included among the first 13 inaugural leaders, trailblazers and legends to be inducted in the new California Hall of Fame. Other inductees include Cesar Chavez, Walt Disney, Amelia Earhart, Clint Eastwood, Frank Gehry, David Ho, M.D., Billie Jean King, Ronald Reagan, Sally Ride, Alice Walker and the Hearst and Packard Families. The California Museum website include an entry on John Muir as an inductee in the new California Hall of Fame, using the Sierra Club John Muir Exhibit's short Muir biography. In presenting the first inductees, First Lady Maria Shriver described Muir as "the person who graces our quarter - the California Quarter. He's the founding father of our environmental movement, of our national park system, who taught us to respect and take care of the land that we live on, and the air we breathe." Conceived by First Lady Maria Shriver, the California Hall of Fame was established to recognize individuals who embody California’s innovative spirit. Inductees will come from all walks of life, and are people who have made distinguished achievements across many fields including the arts, education, business and labor, science, sports, philanthropy and public service. Inductees (or their families for posthumous awards) will be installed at a formal, annual event each year at the California Museum for History, Women and the Arts in Sacramento. The accomplishments of each inductee will be made part of the permanent record in the California State Archives and become the subject of a year-round education campaign. In addition, their unique stories and personal achievements will be showcased at the California Museum in a permanent exhibit serving as the visual, encyclopedic record of the California Hall of Fame and its inductees. A California Hall of Fame selection committee, comprising representatives from the California Museum, the California Arts Council, and the Governor’s and First Lady’s Offices, established selection and eligibility criteria for inductees. The inaugural inductees were selected in consultation with California historian Kevin Starr, California State Archivist Nancy Zimmelman and California State Librarian Susan Hildreth. The committee’s recommendations were presented to Governor Schwarzenegger in May 2006 for approval. The inaugural Hall of Fame induction ceremony was held on December 6, 2006, at the California Museum in Sacramento, with the presentation of the first " Spirit of California" Medals by Governor Schwarzenegger and First Lady Maria Shriver. At this event, each inductee (or their family representative) in the Hall of Fame introduced the next inductee on the list. John Muir was introduced by Amy Butler, niece of Amelia Earheart, who described Muir as "one of the most beloved figures in the history of California, because he devoted his life to preserving the state's natural beauty." She recognized his role in founding the Sierra Club, "to this day, one of the world's most important and influential environmental organizations." 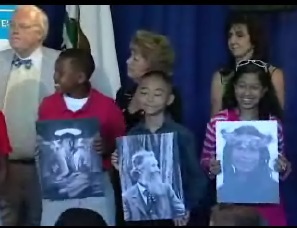 Ross Hanna, Muir's grandson, accepted the posthumous award for John Muir. After the December 6 ceremony, the California Hall of Fame exhibt was opened. This exhibit is comprised of a stunning installation in the Museum lobby, as well as a phenomenal collection of over 100 historic and original items representing the lives and legacies of the inductees, located on the second floor. The Spirit of California Medal (depicted in upper right of this page) is the tangible representation of the inductee’s installation into the California Hall of Fame. This Medal will be given to inductees (or their families, if a posthumous award) each year at a formal state induction ceremony. The California Museum inspires men, women, and children to dream the California dream and to dare to make their mark on history. The California Museum is located at 1020 O Street in Sacramento. For more information about the museum, visit www.californiamuseum.org.